Then I notice Bernadine is holding out a second gas mask for me, price tag still dangling. She remembered my birthday. I fold my arms. “How did you pay for that?” I ask. Because behind my back she had cashed out our 401k and dissipated it on eBay. Our frantic accountant told me to cut up all the credit cards but the damage was done. She installed three file cabinets, stenciled on them the words “New World Order,” and filled them with nonsense. She pasted over the Luke Perry posters with special rush orders from far-off universities: star charts of the southern sky, annotated printouts of Nostradamus’ deeper cuts, mass spectrometry reports from Lake Ashinoko, schematics of unusual nucleotides in certain Endopterygota, seismic charts of the Plain states. I’d had my Thanksgiving and Christmas dinners at the Chinese stall in the mall food court while she clicked through two hundred dollar online classes called “Pleiadian Ship Physics” and “Bilderberg Plots Deciphered Through Numerology.” I would get these invoices in the mail, and ask, “What is this? What is this?” Every night I feel in my knees the swelling interest on our Visa. I’d chase ambulances if not for my hips. Bernadine reveals that she’d bought my present by unearthing Tricia’s old college Mastercard, somehow two months before expiry, with a fresh five hundred dollar credit line. “Her last gift to us,” she says, reaching under her trunk to dab her eyes. I ask, if she’s so scared of the air, why she insists on bothering me out here. She says because we never do anything together anymore. She knows it’s partly her fault, but she promises to do better. She looks up at the white smoke beginning to descend, and tightens the straps of her mask. She wants to speak, but is scared to breathe. Finally, in a small voice, she says that in the coming apocalypse she wants me by her side. Then, even smaller, she adds, we’re not too old to try again. I’m dizzy, concussed, with the full and final measure of her insanity. See, we decide each morning to live or not; we hold up our prospects beside our debts as we brush our remaining teeth and fasten our clothes with fingers that won’t bend. But Bernadine has unlocked that question and all others. She breathes only the air that she wants and discards the rest. She is invulnerable now. I tell her that’s the dumbest thing she’s ever said. I knock her hand away and the mask falls off the porch, into the yard. 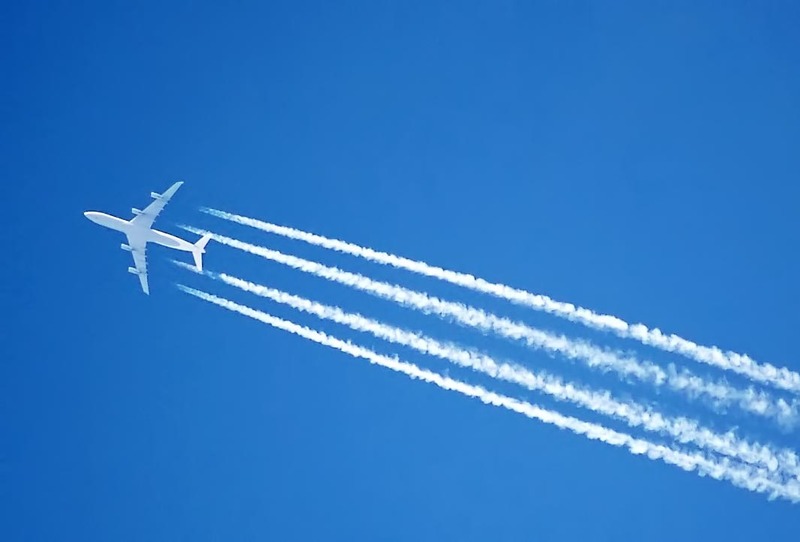 I take a deep sniff and say if the government wants to poison me from every 747 it would be doing me a favor. I can’t see her eyes behind the mask but its trunk quivers. Delta 49 is a distant dot, descending beyond the city skyline into an ozone haze. Bernadine, named for the saint, takes out her pocket actuarial table, finds the row and column that corresponds to my remaining soul, and informs me that the mask won’t matter anyway. C.D. FRELINGHUYSEN is a writer in Oakland, California. He is a graduate of the MFA program at San Francisco State, and has pieces published in Limehawk and JMWW, the latter of which has been included in the Wigleaf Top 50 Very Short Fictions of 2018.